Reservations required for groups of eight or more. Our Tasting Room, located in the beautiful Edna Valley, is the result of 45 years of work by a single family, starting when Catharine and Jack Niven first planted grapes here in 1973, founding Paragon Vineyards. 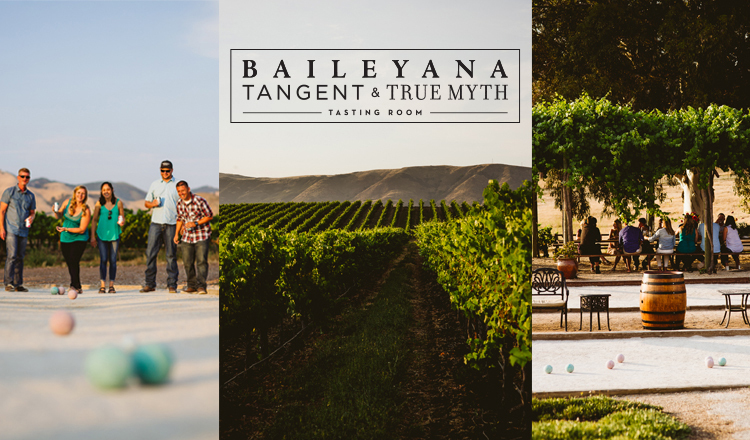 Today, the business is operated by second and third generation family members and has grown to include over 30 different wines under four separate labels: Baileyana, Tangent & True Myth, plus Zocker. All these wines are sold at our tasting room located in the historic Independence Schoolhouse, built in 1909. The current building includes some of the original windows, siding and floorboards, preserving history while adding to a uniquely attractive setting for the tasting room and extensive gift shop. Surrounding the tasting room are expansive picnic areas with stunning views of the SIP-Certified Estate Paragon Vineyard. Two full-size Bocce courts are available for your use, or just sit and enjoy the views of the vines across the valley to the mountains. So, on your next day trip consider visiting our charming tasting room, where you can appreciate Mother Nature and taste unique wines from one of the most special micro climates on earth. You have the options to delight in a memorable tasting experience from the friendly and knowledgeable staff or purchase wine by the glass or bottle to accompany a game of bocce ball or a relaxing afternoon outside. Tangent - where white wines are explored in a boundless environment (try the Albariño, Pinot Gris and Sauvignon Blanc). True Myth – Experience Mother Nature’s gift with the best of SLO County (try the Reserve Cabernet Sauvignon from Paso Robles and three red wine blends showcasing the diversity of SLO County, based on Syrah, Cabernet Sauvignon, Tempranillo, and Grenache. Zocker - well known for its obscure, cool climate California Grüner Veltliner and Riesling. While visiting the Independence Schoolhouse, sit back and relax around our ample patio and lawn areas with a glass of wine. Enjoy the SLO life; bring a picnic and a group of friends for an afternoon of wine and bocce ball!